Turkey is more like Hungary than Sweden, more like Russia than France. The winner is certain. Erdoğan will be president and the AKP have an absolute majority. With or without manipulation, with or without violence. June 2015: for the first time since 2002, no party had an absolute majority in parliament. The governing AKP (Justice and Development Party) reached almost 41 percent, the CHP (Republican People’s Party) almost 25 percent and two more parties entered parliament with 16 (MHP) and 13 percent (HDP). A coalition was needed. What happened instead until new elections took place in November 2015 was according to the Human Rights Association IHD: 423 people, both security forces and civilians, were killed, 1,281 people injured, 5,713 taken into custody, 1,004 people arrested, 133 attacks against buildings of the HDP, 8 against the AKP and 3 against the CHP. 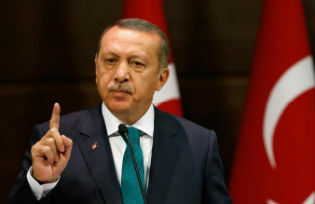 President Erdoğan commented: This would not have happened if you had given us 400 MPs (= two third majority to be able to change the constitution). April 2017: a referendum on constitutional changes took place, changing the political system in Turkey from parliamentary to presidential, which would become fully operational with the following elections (=now, in June). For the first time in recent history, election fraud was a bigger issue. Especially dubious was the decision of the YSK (Supreme Electoral Council) to also accept unsealed ballot papers in the afternoon during the referendum. On 13 March 2018, a new electoral bill was passed, which gives permission to the YSK to regard unsealed ballots as valid. What sense does it then make to seal ballot sheets and envelopes at all, if all are accepted? This is not the only thing raising doubts about a fair voting process. There is controversy on the election observation, which, until now, was carried out by members of various political parties and NGOs like Vote and Beyond. Now, the heads of all election offices will be civil servants, whose list will be sent from the governor to the provincial election boards. All governors are appointed by the AKP. Let’s forget this for a moment and assume that the election day will be fair even if the campaign is not, with the government controlling directly or indirectly 90 percent of the media and having the most resources, including access to the state budget. Then, there is the possibility for the opposition to force Erdoğan into a second round and have the AKP lose its absolute majority in parliament, also in coalition with the nationalist MHP (both parties form an election alliance, together with the small BBP). The possibility of having an election alliance with two or more parties was introduced in the new election law, to save the MHP from dropping out of parliament, because the 10% threshold remains in place. However, the move helped the opposition more than the government, because the voters who voted strategically for the AKP, because a vote to a small party was a lost vote, will now return to their preferred party, which will jump over the 10% threshold with a partner or partners. This is in particular true for the Islamist Party Saadet (Felicity), which between 2002 and 2015 had between 2 and 0.5% of the votes, but a potential of roughly 5-7 percent. Saadet now will attract its full potential, because jumping over the threshold is guaranteed in alliance with the newly founded IYI Party (Good Party) by former minister of the interior Aksener. This constellation makes an absolute majority for the AKP difficult, because the votes will be more split than ever, with smaller parties now entering parliament in alliances. Saadet gets its votes to almost 100% from the AKP, but also centre-right parties like DP take votes from the AKP than from other parties and the Good Party, an offspring of the MHP, which will take at least half of the votes from the MHP. This could lead to a situation of AKP and allies get 45% against all the opposition getting 50%, some votes will be lost because of the threshold. Coming to the presidential elections. After Abdullah Gül renounced his candidacy, because there was no big alliance supporting him, many parties will have candidates. It will resemble a little bit a first round in a French presidential election. Besides the AKP with Erdoğan and Iyi Party with Aksener, also the Kemalist CHP and left-Kurdish HDP will have their candidates. Parties, which do not have a parliamentary group (at least 20MPs) have to collect at least 100,000 signatures from 4 to 9 May. The same is true for independent candidates. So far, the three small centre-right parties AP, ANAP and DYP have announced a common candidate, as has the nationalist Vatan Party and at least one independent, Tuma Beklevic, a former adviser to Erdoğan. If Saadet will come up with its own candidate, also they have to collect 100,000 signatures, because it doesn’t have a parliamentary group. Still, this means that there will be more than 5 candidates. In 2014, when the president was elected for the first time directly, there were only 3 candidates. Erdoğan reached 52 percent. Now, with the vote more split and candidates, who are also attractive among Erdoğan’s core voters, mathematics would suggest that obtaining more than 50% could be difficult. If Turkey were a democratic country with fair elections, this would be an exciting election campaign period. Well, if.